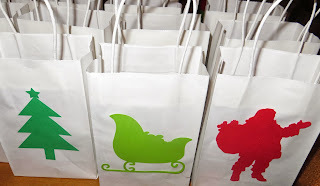 We have several kids that we need to get a small Christmas gift - a gesture of thoughtfulness without spending a lot of money. 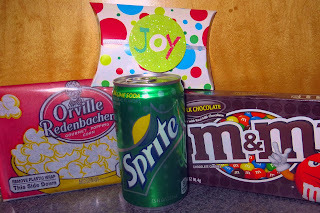 This year, I decided to make them all Movie Night gift bags. Each gift bag has a popcorn, movie-sized M&M box, mini sprite, & $2 to rent a Redbox game or movie. I made a Redbox label to wrap around the $2 and put all of it in a small gift card box. 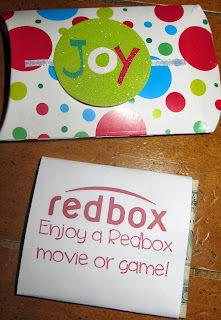 You can download the Redbox wrap labels HERE. I put everything in a plain white bag and added Christmas shapes cut with my Silhouette. 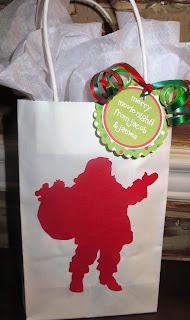 Then, I added a cute Merry Movie Night gift tag which you can download HERE. I know my kids would LOVE to get this as a gift and I LOVE that it's a cheap, fun gift!